St. Martin's Press, 9780312939472, 454pp. "A smash bestseller that spent over six months on the "New York Times" bestseller list, "FLIGHT OF THE INTRUDER" became an instant classic. No one before or since ever captured the world of Navy carrier pilots with the gripping realism of ""Vietnam"" veteran Stephen Coonts, who lived the life he wrote about. More than a flying story, "FLIGHT OF THE INTRUDER" is also one of the best novels ever written about the ""Vietnam"" experience. It's all here-the flying, the dying, the blood and bombs and bullets, and the sheer joy-and terror-of life at full throttle." Grazing the Vietnam treetops at night at just under the speed of sound, A-6 Intruder pilot Jake "Cool Hand" Grafton knows exactly how precarious life is. Landing on a heaving aircraft carrier, dodging missiles locked on his fighter, flying through clouds of flak-he knows each flight could be his last. Yet he straps himself into a cockpit every day. Jake and his new bombardier, ice-cold Tiger Cole, are going to pick their own target and hit the enemy where it hurts. But to get there and back in one piece is going to take a lot of nerve, even more skill, and an incredible amount of raw courage. Before it's over, they're going to fly into hell. "When Grafton is at the controls of his Intruder, the novel comes alive with a jolt." 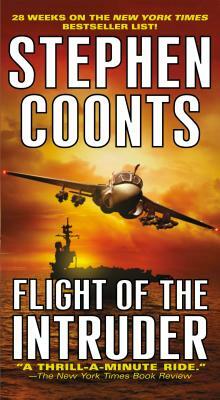 Author of 13 "New York Times" Bestsellers, STEPHEN COONTS flew A-6 Intruders from the deck of the USS ENTERPRISE during the Vietnam War. A graduate of West Virginia University and the University of Colorado School of Law, he and his wife Deborah still fly whenever they have the time. They reside in Las Vegas, Nevada. "Kept me strapped in the cockpit of the author's imagination for a down-and-dirty novel."